Access Control systems dictate who, when, and where a facility or resource can be accessed. In order for a user to gain access in a single factor transaction, they must provide the required credentials. Credentials can be a keypad combination, a biometric scan such as a fingerprint or retinal scan, or a swipe of a card containing the required information. So the user presents their credentials to the control panel, and the software on the control panel compares the provided credentials with the ones stored in the database. If the credentials match a database entry, access is granted. Two factor credentials are in place to prevent users from sharing access. With many single factor credential systems, one user can simply lend out their card or share their password with another user and now the second user has access beyond their restrictions. Or one user can take the credentials of another without permission. In two factor systems, the user must present two different required credentials. This might be a password and a biometric scan, for example. For inquiries about implementing an Access Control System in the Sacramento Valley, call 916-929-5595. 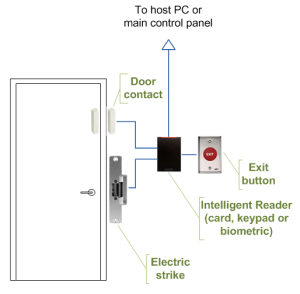 For more information on Access Control systems, visit this Wikipedia page.